A patio is a beautiful extension to a home and turning your entertainment space into a comfortable feel will give more options on enjoying the area so much more. Working out how you and the family would like to use the area can also help in some decorating tips and ideas, colours can follow on from the indoors bringing them outdoors. Do you have young children who will need a special space for toys and play items? Will pets need be given a segmented area and then where to entertain when you and guests are having a social gathering. Patio flooring can come in many looks, from concreting, bricks or decking and a lovely finish would be to add a floor rug or carpet piece for instance near seating giving a nice feel of the inside of the home coming to the outdoors. There are some great pieces of art that can be hung or displayed to give the added wow factor to your patio, complimenting the space, keeping in mind that too much can overwhelm an area but a little here and there can be a nice touch to the colour scheme. Sounds of running, trickling water just puts you in a place of relaxation in a garden space, having a water feature amongst the plantation is a wonderful. What works great with garden spaces is you can go tropical having a beach setting theme, a Balinese with a Buddha statue or a Japanese theme with fish as a highlight, really it’s all up to the imagination. Depending on the design of your patio you may need to add blinds for blocking out the sun or wind or have a patio heater or another sources of heating element to make the area cosy and more comfortable. Looking for individual style for your Patio? CPR Outdoor Centre have a fantastic range for you to choose from to suit your style and needs, contact the office today at Bunbury on 9726 2311 or Busselton 9754 2657. Is Trex Composite Decking Better Than Wood? Trex has been been perfecting the design and maintenance for decking, giving a high performance for outdoor living since 1996. Trex Composite Decking is a wonderful way to bring in the glorious look finish of natural wood decking but will save on maintenance and time in the up keep. Trex has been designed for the wood lovers and giving a product that is eco friendly that can withstand years of what natures elements can expose to them. There isn’t a comparison of Trex v’s Wood as the two meet their needs depending on the area of space you would like your decking, budget and your time you would like to invest keeping your decking working for you. Choice of fade resistant colours hits all the beautiful looks of wood tones, with showing the wood grain to the feel of the authentic wood. A selection of classic earth tones or tropical colours will ensure you have your decking as an added feature of your home. Trex Composite is a blend of 95% recycled wood with a plastic film. Having this protective coating protects from mould and mildew building in the winter months and when the sun is beating down the up keep for painting and oiling is not necessary. Products of Trex select and Trex enhance are all backed by a 25 year warranty with limited residential fade and staining included. Trex decking is contributing to keeping the environment healthy with their decking composed of 95% of recycled materials. Trex is saving 400 million pounds of plastic each year. Looking for superior products with strength and durability with a 25 year guarantee. Contact CPR Outdoor Centre in Bunbury on 9726 2311 or Busselton on 9754 2657. When it comes to your patio you want make it an extension of your home so the structure and the additional features need to blend in with the foundation it is extending from. COLORBOND® gives this flexibility of choice and style. 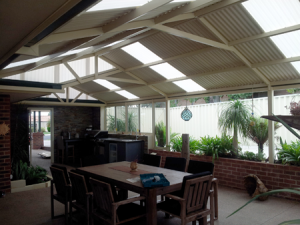 BlueScope steel is welded to the highest Australian Standards giving a superior finish to your new patio space. When you deal with a professional patio installer your council approvals will all be organised and the service is there for you from the beginning and after the installation for your continued satisfaction. Due to the product being Thermal efficient is has a solar reflective effect making it resilient to Australian weather conditions. Contains recyclable materials, making it 100% recyclable, giving back to the environment. COLORBOND® has been put through some vigorous testing and the CSIRO investigation and research reported that steel fences offer greater protection in the event of a fire. This protection is also true for walling, gutters and downpipes. COLORBOND® is backed by BlueScope known to be one of Australia’s largest manufacturers. Before COLORBOND® is purchased an eligibility criteria is required. This ensures that all builders and installers get a pre approved warranty if the criteria is met. Australian weather conditions offer great climate changes and COLORBOND® have tested their products in all these elements in the different areas including severe marine environments to tropical and industrial locations, displays showing the different pitches mirroring different ways the products can be displayed at homes. In addition to testing for corrosion and durability being done in laboratories. CPR Outdoor Centre knows how important quality is, we will help organise all permits and approvals when it comes to building your patio, carports, garages or sheds. Contact the team at Bunbury on 9726 2311 or Busselton on 9754 2657. Why purchase DIY garage kits from CPR Outdoor Centre? A garage is a worthy addition to your home. They don’t just enhance your home’s outside appearance but is also very functional. A garage can provide a safe place to store your car so you can sleep well at night knowing your precious car is safe and sound. In the old days, a garage could only be installed by a professional installer. Nowadays, things are different. With people honing in on their skills, more and more of us are looking for DIY projects – including DIY garage kits. Remember to get the appropriate permits from your local shire. Yes, you read it right – DIY garage kits! These are prefabricated garage kits that work well to fill all sorts of residential garage storage needs. You can purchase these kits to give a new home, your car or just to add that extra storage space you badly need. What makes DIY garage kits a good option is that they are quick and easy to construct. Want to purchase a DIY garage kit? Choose CPR Outdoor Centre for all your needs. CPR Outdoor Centre offers DIY kits for the garages, patios and carports. Our garage kits come in an option that will work for the differing needs of our customers. Our DIY garage kits are made from high quality materials ensuring you of a durable garage – your garage will last for many years! Don’t worry; our DIY garage kits come with certified engineered plans that are customised to meet all building requirements. With the help of a friend or 2, you can erect your DIY garage kit in a weekend. Then you can enjoy a well earnedbarbecue, admiring your newly built garage. However, should you need CPR Outdoor Centre can do the full job from permits to the installation for you, just let us know. We also offer installation services for garages, carports and patios. Contact us today – CPR Outdoor Busselton on 9754 2657and CPR Outdoor Bunbury on 9726 2311. Whether it’s a DIY garage kit or installation services you are looking for, call us – we’ve got you covered. How to Build A Shed on A Slope? Land comes in a vast range of dimensions from flat to hillsides and when building properties with that magical view, you might need to also think about where to build a future workshop or shed. This should be an added feature that compliments the home or building too. There are some different processes that have to be done for the foundations to secure the structure. Prepare yourself by asking the right questions and seek advice from a professional builder or engineer and when getting your shed installed by a leading shed designer who will ensure that all the fundamental processes are in place before the build is to be done. Giving thought to what the intended use for the shed could be will be beneficial for knowing the best access points, size doors and height factors especially if storing boats, caravans or big items and being able to easily bring the items in and out of the shed easy enough. Permits and approvals should always be looked at first so that if certain requirements need to be put in place your design can be easily adjusted. Different areas have height restrictions by council regulations so getting all the information right the first time won’t hinder the building process. Access points should be as level as possible and this will come down to the structure of the build, support with retaining walls and decking so discussing this with your professional installer in the designing stage is paramount. Having access around the whole perimeter of the shed is important for maintenance, although if a retaining wall has been fixed to part of the shed this will block part of the shed access, this too is something that will need to be discussed further with the professional shed installer. When it comes to all your shed needs, CPR Outdoor Centre are the professionals in the industry, making building your shed easy, from organising permits and a complete service throughout so you don’t have to lift a finger. Contact CPR Outdoor Centre for a free quote today! Call Bunbury office at 9726 2311 or Busselton at 9754 2657. Summer is a wonderful time to enjoy a deck and now with the choice of composite decking you can still have the wonderful look of timber with high durability in all weather conditions due to the shell technology and stain protection. Having decking installed around pools, for a gazebo, pergola or even a verandah around your home gives a beautiful finish with a variety of colours of tones and wood grain features. Trex Decking is your outdeck timber of choice giving industry leading and warranty coverage of 25 years. Having the option for another dining area gives more room when having social gatherings or enjoying those summer nights having a bbq or parties. Installing the dining space close to your indoor kitchen will help with minimising trips back and forth. Trex decking material has the added protection for weather conditions especially water so using composite decking around pools or spa areas give a nice finish to the entertainment space. All foundations and framing is built in mind to hand the loads. Added design features could be to have multilevel decking this especially works well in different levels of a backyard or if you would like a certain configuration with stairs or stand alone areas, changes the whole look of your space and opens up your entertainment options too. Why stop at just decking! A beautiful finish to any decking space is having the areas framed with railings. This is great for added privacy from the outdoors, making a defined look for a seating area or around that beautiful big tree in the backyard. Wanting to Know How You Can Get Trex Composite Decking Installed for Your Patio? When you are wanting to build the perfect decking look no further than CPR Outdoor Centre Patio. You will be investing with Trex products that has steel deck framing, technology, superior fasteners with a great range of colours and designs. Contact CPR Outdoor Centre in Bunbury on 9726 2311 or Busselton on 9754 2657. To Bernie and Barbara of Western Australia. They are the successful winners from CPR Outdoor Centres competition held recently to win the 2 nights accommodation package at the Quality Apartments Banksia Gardens Albany and a dinner for 2 at BG’s Kitchen. Bernie and Barbara purchased and are now are the happy owners of a Portico Gable with a flat patio attached to either side, that is currently being paved to show the wonderful design and structure that CPR Outdoor Centre can create for your patio and shed solutions. When it comes to your patios, garages and sheds CPR Outdoor Centre have the right installation for you. All council approval and water corporation approvals are dealt with so all you need to do is enjoy your new space. or Busselton 1/30 Barlee Street 9754 2657.